One of the main reasons she chose UW–Madison “is the strong stem cell research center here,” says Molugu, a biophysics research assistant at the Wisconsin Institute for Discovery and a trainee with the UW’s Stem Cell and Regenerative Medicine Center (SCRMC). Twenty years ago, as a young UW–Madison scientist, James Thomson published a groundbreaking discovery in the journal Science. He and his lab successfully cultured human embryonic stem cells, which carry the potential to become any cell in the human body. In 2007, scientist Junying Yu and Thomson — today, the director of regenerative biology at the Morgridge Institute for Research — successfully reprogrammed human adult cells into induced pluripotent stem cells. This meant virtually any cell could become a stem cell and opened the possibility that patients could be treated for disease with healthy versions of their own cells, reducing the chance of immune system rejection. Together, the findings have provided researchers around the world new opportunities to understand human biology, develop drug treatments and explore cell-based medical therapies. The results of Thomson’s work continue to attract top graduate students to UW–Madison. It is the place to be for graduate students looking for guidance and growth in stem cell work, Molugu says. Her research focuses on the process of reprogramming adult cells, such as skin or blood cells, into stem cells. For biomedical engineering graduate student Angie Xie the fact that these stem cells were first grown in Wisconsin, her home state, is a source of pride and connection to her interest in the field. Angie Xie, graduate student and Biotechnology Training Program (BTP) trainee. Photo: Bryce Richter. 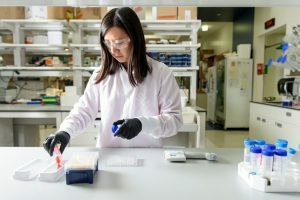 “Being from the state, as well as the strength in the stem cell research area — looking at the expertise of how many great stem cell faculty we have here — certainly that was the main influence for coming back,” says Xie, who holds a National Science Foundation Graduate Research Fellowship to pursue stem cell research at UW–Madison and is also a Biotechnology Training Program (BTP) trainee. As a member of bioengineering Professor Bill Murphy’s Bioinspired Materials Laboratory, Xie develops synthetic materials that aid stem cells in the processes of differentiation or expansion, decreasing the manufacturing costs of clinical applications of stem cells. 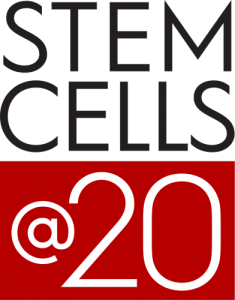 The UW–Madison campus offers a web of opportunities in stem cell research and the SCRMC serves as its hub. It spans 40 departments and 10 centers and institutes, and provides students and faculty a chance to collaborate. For instance, students can get involved in the Wisconsin Stem Cell Roundtable (WiSCR), a graduate student and postdoctoral scholar association for stem cell researchers. Aaron Simmons, graduate student and Biotechnology Training Program (BTP) trainee. Photo: Bryce Richter. 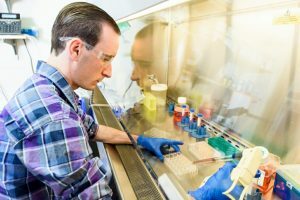 Chemical engineering graduate student Aaron Simmons says the network of stem cell experts on campus bolsters his research. He studies how to better derive cardiomyocytes, or beating heart cells, from stem cells. Cardiomyocyte therapies could help doctors repair patients’ hearts by replacing cells, which do not automatically regenerate after events such as a heart attack. One key criterion Simmons weighed in deciding between graduate schools was the combined strength of the institution’s medical school and its programs in chemical engineering and bioengineering. “One of the big things that can definitely help translation of any stem cell research or any bioresearch, in general, is having a strong biomedical engineering program — you’re going to have the facilities to be able to do some more of that research — and then the medical school to be able to have strong clinical collaborators in the field,” Simmons says. Xie appreciates the diversity within UW–Madison’s stem cell research community. It has helped create a symbiosis between researchers who focus on stem cells, and non-specialists who can bolster their research by branching into stem cell work. Story by Meghan Chua for the UW–Madison Graduate School.